So far in our skating series we have covered the basic hockey stance, the forward stride, stopping, turning, edges, and balance. You should have a pretty good grasp on skating by now but what about transitions? This is when you are skating forwards and need to switch to skating backwards, or you are skating backwards and need to turn and go forwards. This happens a lot in hockey (especially if you play defense) so you want to make sure you are doing it properly. There are actually ways to do each transition (or turn). The first method is fine for beginners because it helps them stay balanced and get used to the motion, however once they get better they will need to learn the more advanced transitions. 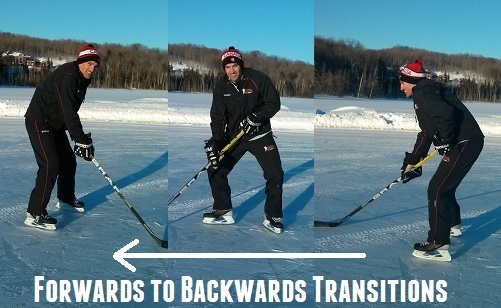 In the video below we outline both ways to turn from forwards to backwards and turn from backwards to forwards. When you first start out, we just want to get you used to turning around from forwards to backwards or backwards to forwards while moving. To do this you can keep both feet on the ice. Essentially all you need to do is rotate the hips a bit, push one foot around in front and bring the other foot around behind you. To do this in the other direction you just start with the weight on your left leg and rotate in the other direction. Now plant your weight on the right foot and bring your left leg around so you are now going forwards. I thought you made a video about switching from forward to backward while skating in a circle (basically a 3-turn). Can you help me find it? 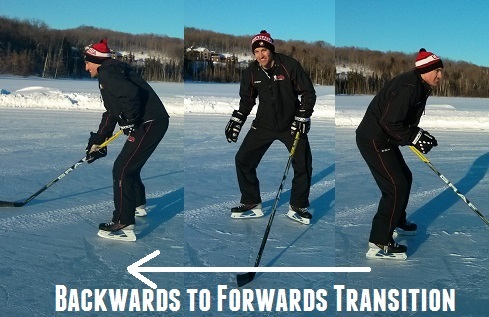 I recently went to a Weekend Warriors adult hockey camp, and we did a drill focusing on forward to backward and backward to forward transitions. I felt well ahead of the group because I had watched this video. Thanks for the help.